As the winds of change howled around us in 2016, we could rest assured that our papers and files would not be swept away … thanks to our turtle paperweights. Simply put, turtle paperweights are paperweights shaped like turtles, and they truly dominated headlines (and our dreams) throughout the past year. 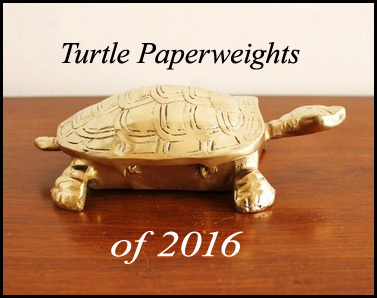 Any year is a good year for turtle paperweights, but 2016 was on a whole different level. It was spectacular. “If you’re not in the turtle paperweight game, get off the field,” could well be 2016’s official motto.